The Nigerian Navy (NN) wednesday received Prince Charles of Wales as part of efforts to deepen the dividends of maritime security cooperation between the United Kingdom and Nigeria. The visit was quite symbolic given that the NN was an off shoot of Britain's Royal Navy before Nigerian gained independence. 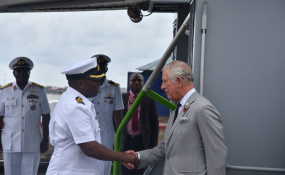 The Prince of Wales who arrived at the jetty of the Naval Dockyard Limited in Victoria Island, Lagos, at about 1:46 p.m. was received by the Chief of Naval Staff, Vice Admiral Ibok-Ete Ibas. After mounting the podium, the Nigerian navy Ceremonial Guard presented the salute before playing one stanza of the UK National Anthem. He immediately boarded Nigerian Navy Ship (NNS) EKULU, where the Commanding Officer, Commander Andrew Zidon, received him alongside the Flag Officer Commanding, Western Naval Command, Rear Admiral Habila Ngalabak, and other senior officers who paid compliments too. After he was escorted to the quarterdeck and ascended to the Flying Bridge, he was received onboard and saluted by all before the vessel set sail. While at sea, the heir apparent to the British throne received a brief overview of UK defence in Nigeria and the gains of the NN in securing the country's vast maritime domain. As he began sailing the area of responsibility (AOR), the objective of the visit was thus achieved. He was afterwards escorted to the wardroom by Zidon and invited to sign the ship visitors book before he bid farewell and disembarked. Charles however paused to receive a hearty three cheers from the ship company before departing with his team. According to information provided by the Director Navy Information Officer, Commodore Ayo Olugbode, the objectives of the visit was to highlight and demonstrate to the prince the UK maritime contribution to defence engagement in Nigeria and the importance of Lagos Harbour to the Nigerian economy. He said: "Another objective of his visit was to strengthen relations with the Nigerian navy by visiting NNS EKULU and meeting the Chief of Naval Staff and other personnel. "The visit was also an opportunity to raise the profile of UK-Nigerian maritime security cooperation." Ibas, while speaking with journalists after the departure of Prince Charles, said the visit was an encouragement for the navy, adding that it would also show the participation of the royal navy on our waters. According to the Chief of Naval Staff, "The Nigerian Navy is an offshoot of the Royal Navy and he was also here to see by himself the progress being made through the cooperative support the royal navy has been giving Nigeria."